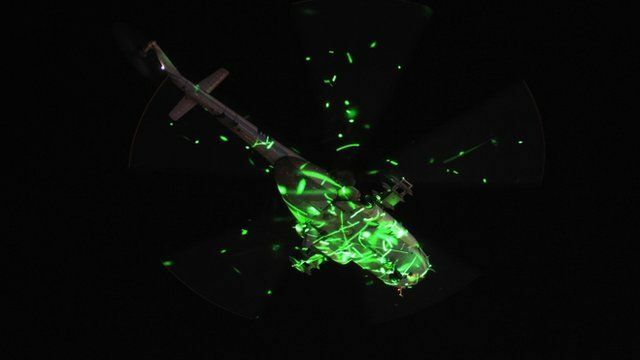 Lasers light up Egypt army helicopter Jump to media player Egyptian military helicopters hovered over tens of thousands of people gathered in Tahrir Square on Wednesday after the army ousted President Mohammed Morsi. 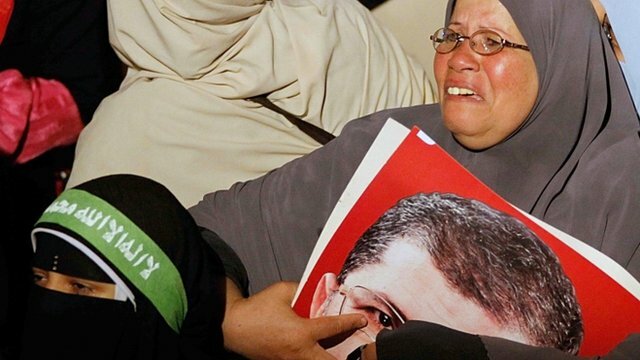 Egypt army: Morsi 'no longer in office' Jump to media player The head of Egypt's army has given a TV address, announcing that President Mohammed Morsi is no longer in office. 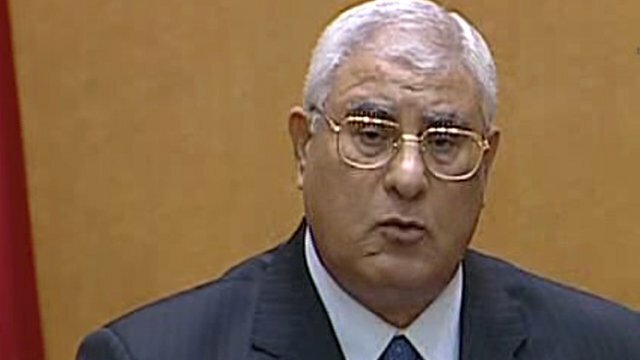 'I salute the people of Egypt' Jump to media player The top judge of Egypt's Constitutional Court, Adly Mansour, has been sworn in as interim leader. He praised the nation's people for their fortitude and discipline. 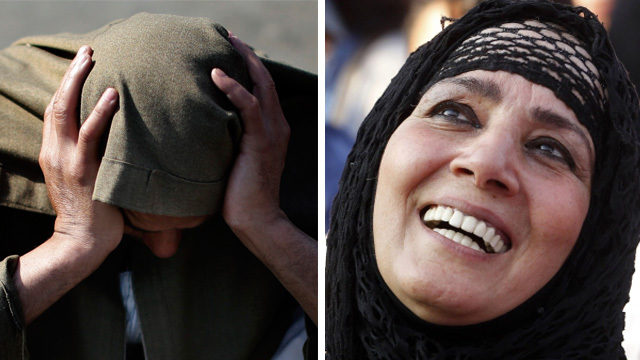 Two new Egypts emerge from unrest Jump to media player Egypt's top judge has been sworn in as the country's interim leader after the army removed President Mohammed Morsi. Anti-Morsi protester: 'I am euphoric' Jump to media player Anti-Morsi protestor, Cairo businesswoman and activist Soraya Bahgat has said there is a "massive celebration" in Cairo after the head of the Egyptian army announced the suspension of the constitution. 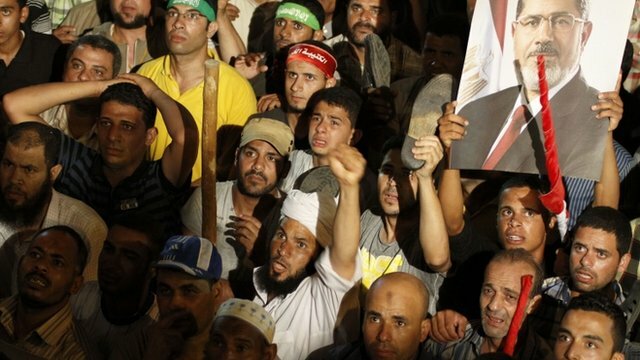 'Pro-Morsi camp attacked' Jump to media player Muslim Brotherhood spokesman Gehad el-Haddad tells the BBC the pro-Morsi protest in Cairo has been attacked by "thugs with machine guns". 'Political Islam is the people's choice' Jump to media player Supporters of the ousted Egyptian President Mohammed Morsi have been taking to the streets to resist what they call a coup against democracy, raising fears of violent clashes between the two sides. 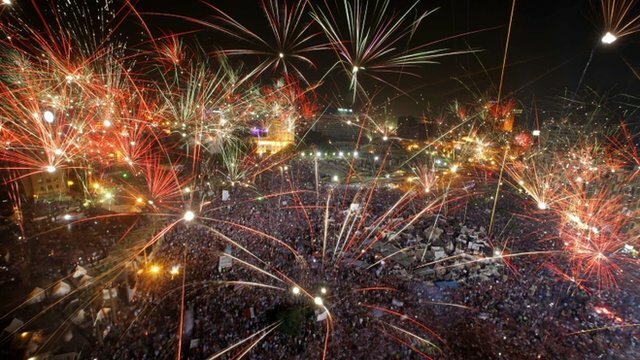 Egyptian military helicopters hovered over tens of thousands of people gathered in Tahrir Square on Wednesday after the army ousted President Mohammed Morsi. Many waved flags and shone laser beams at the aircraft flying overhead. 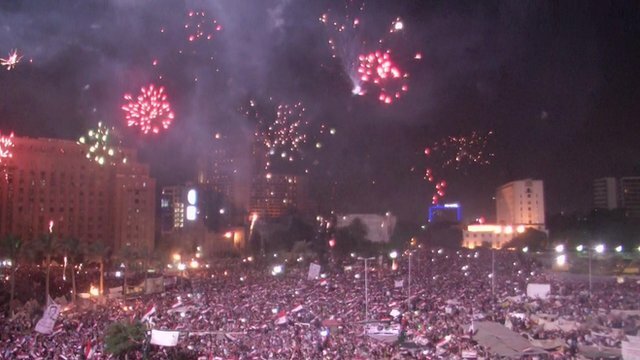 The helicopters intermittently flew across the sky, showering the crowds below with small Egyptian flags.